When you pass a test and get your new driver's licence, you probably stop at the licensing centre to pick up a handful of those plastic plates that fly/fall off, crack, get lost, leave grubby marks and damage paintwork. It’s easy to get frustrated with these terrible plates that you have to replace constantly. Luckily, there’s a better solution that’s available all across Australia. NOTE: If you're not based in NSW, you can use plates on the inside of your car. Here's some L plates, Red P plates, and Green P plates, that use suction cups to stick on the inside of the window. These are cheap, easy to install, and should last the whole time you need them. If you are based in NSW, read on for better options for the outside of your car. 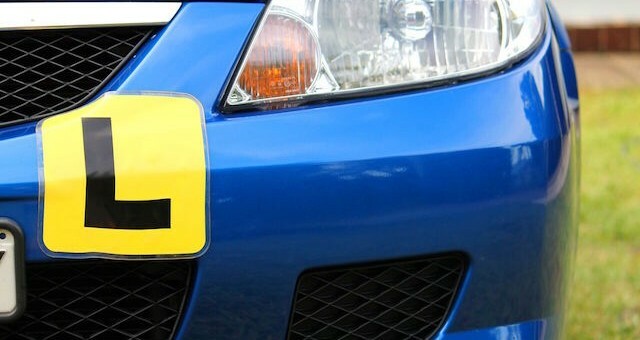 If you’re fed up with lost and broken plates that disappear the minute you get on the highway, you need to get your hands on the best L and P plates available. 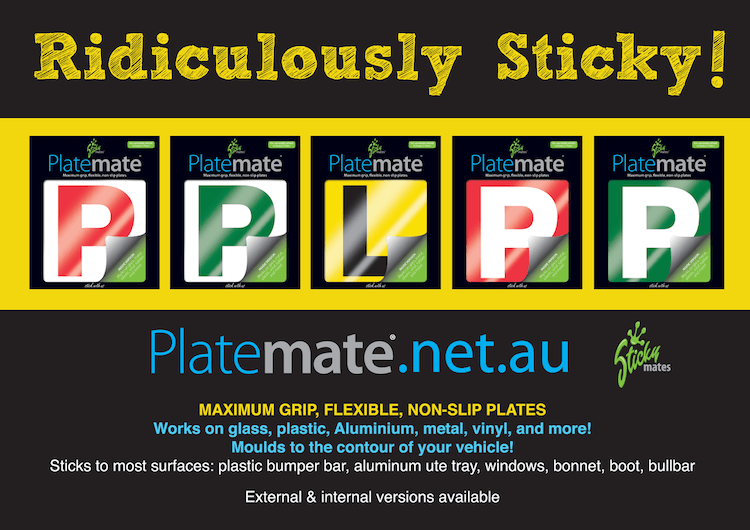 The answer to your problem is the brilliant and ridiculously sticky L & P plates made by Australian company PlateMate. PlateMate plates come in a range of designs for use inside and outside your car. PlateMate have L plates and both red P plates and green P plates. They even sell them based on your home state to ensure you’ll comply with the relevant plate display rules (e.g. in NSW you must display plates on the outside of your vehicle). Made with the latest developments in nanotechnology and clever suction cup pad design, the sticky surface of the plate acts like millions of vacuums that give them maximum grip and stop them from slipping on your car. You can rest assured that your plate won’t be coming off once you’ve got it on. 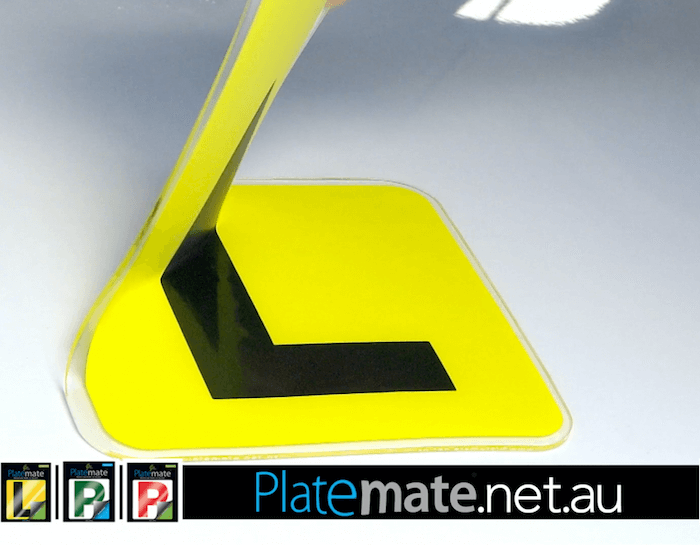 As well as being incredibly sticky, these L & P Plates are also flexible. This means you can put the plate anywhere you like and don’t have to search for a piece of flat real estate big enough on your bonnet or boot. PlateMate plates were designed by Australians for Australian conditions and are incredibly resilient. These plates won’t dry out and crack like the ones you're used to. Plus, if they get dirty over time all you have to do is wash them with water and air dry to make them look and stick like they’re brand new. This makes their total cost of ownership lower than cheaper alternatives. Because PlateMate plates don’t have to be replaced several times during your learner or provisional/probationary period the value for money is amazing! This is even more true with the exclusive deal being offered to Driving Test NSW users. If you go on PlateMate and buy 2 sets of these amazing plates you’ll get 50% off! You’re effectively getting a buy one get one free deal which means you’ll never have to buy another set of L or P plates again. To take advantage of this awesome offer, go to the PlateMate website, add 2 sets of plates to your cart and use the coupon code "DRIVINGTEST" when checking out. What about magnetic L & P plates? Magnetic L & P plates are very common (you can buy them online here) and I used to use them. I stopped because the front magnetic L or P plate had to sit on my bonnet (because it wasn’t flexible). This meant that whenever I got on the highway and built up some speed I’d see my magnetic plate fly off and disappear. Every time this would cost me another $5. If only I’d been using PlateMate from the start, I wouldn’t have wasted my money on time on lower cost plates that just couldn’t get the job done. Do they come off easily when a P plater is not driving.? Yes, the plates simply peel off when not in use (you can store them on the storage board that comes with the original packaging).